Do: Research the company, check out the website, Facebook page, Twitter feed, and other social media before the interview. How does the company present itself, its workplace culture, and its employees? If the dress code appears to be business casual, then break out your slacks and dress shirt. If it’s more formal, then dress the part in traditional business attire form head to foot. Don’t: Dress down. It’s better to be slightly more formal than required than to come to the interview dressed too casually, as this gives the appearance that you are not serious about the position. If you’re unsure at all, dress better than you think is necessary. Do: Project confident body language. Sit up straight, lean slightly forward, and look your interviewer in the eye. Smile and engage with each interviewer and nod slightly as he or she speaks. Don’t: Try not to slouch or cross your arms as questions are asked. Don’t fidget. Try to project body language that is positive and indicates interest. The best way to show confidence is by sitting in an “open stance”. That’s why you shouldn’t cross your arms or do anything that makes you seem hesitant or closed-off. Do: Stay poised and relaxed. Interviews are designed to see how you react to challenge. That’s why so many interviewers try to throw in that one unexpected question. When it comes, be relaxed, flexible, and as engaging as possible. Keep a smile on your face even if you don’t have a ready answer. This will show your interviewer that you don’t get rattled, even when you don’t have all the answers. If you need time to think, say, “that’s a great question, let me think for a second. I want to give you a good answer here.” No hiring manager is going to fault you for doing that once or twice. Don’t: Don’t show signs of panic and don’t lose your cool if things take an unexpected turn or you face a tough question. Also don’t rush while answering. You don’t want to blurt something out that you can’t take back, so stay calm. Do: Let the interviewer feel in control. Let them take the lead and follow the general direction that they’re guiding the conversation in. Chances are they have certain things they need to find out from you in order to know if this job is a good fit. And the more you help them gather this info, the better they’ll feel about you as a candidate (even if you’re missing one or two pieces of experience). Don’t: This doesn’t mean you should be completely passive and let it be a one-sided conversation. Don’t be afraid to ask the interviewer to clarify something, ask questions midway through the interview, or even go back to a topic you previously discussed if you think of something extra you want to share. So while you don’t want to dominate the conversation (remember, the interviewer has topics and questions they *need* to cover), do ask follow up questions and turn the interview into a dialogue, not just a one way question-and-answer session. Do: Go into your interview prepared to highlight the abilities and the aspects of your background that you believe make you a good fit for the position. Take notes on the position and the company, as well as relevant aspects of your qualifications that make you a strong candidate. Taking the time to research the company and job will help you remember what you want to say, and will allow you to weave your knowledge into the answers to their questions. Don’t: The worst mistake you can make is to skip the pre-interview research stage of preparation. Let’s repeat this—the worst mistake you can make is to skip the pre-interview research stage of preparation. Do: Even though your best strategy is to outline the key points you want to make in the interview ahead of time, you also want to demonstrate that you are a good listener and can stay focused and on topic. Listen to each question as it is asked; you may even want to take notes. Then, calmly and confidently, answer the question in a way that highlights your best attributes. Don’t: Resist the temptation to segue too quickly from the topic of your interviewer’s question into your resume. Make sure you tailor your answers in a way that answers the question, stays on topic, and highlights the way your background addresses that topic. If they bring it up then you can bet it’s a focus for them, so make sure you demonstrate that it’s a focus for you as well. Do: Bring up past successes where appropriate, but make sure that you are constantly showing how these past accomplishments will bring value to your next employer. Don’t: It’s tempting to ramble on about your successes in a former job, but do not focus on the specifics of a past role to the point where it dominates the conversation. Remember that even if you loved that former position and learned a great deal from it, your next employer is only interested in how that experience will translate into your new role and benefit them. Do: Be honest about elements of your experience or employment record that may not be ideal for the position. If you have gaps in your resume, experienced a layoff or dismissal, or if you are missing key experiences or skills in the job description, be truthful, and then leverage the conversation back to your strengths. Don’t: Never lie about past employment missteps or pretend to have skills that you do not have. A good interviewer will see through an attempt to mislead. And even if your lie does get you to the next stage in the hiring process, you’re likely to be disqualified later in the vetting process. Do: Give diplomatic responses about all past employers, even if your tenure at a former job ended badly. Try to find something positive you can say about every past work experience on your resume and then pivot to the skills you have gained along the way that will benefit your next employer. Don’t: You will not win points with your next potential boss by speaking badly of a past one. Even if your past employer is a competitor of the company where you want to work, don’t criticize a past employer. You will be seen as petty, or even worse, as a risky hire. Do: Come prepared with questions based on your research of the company. In addition to checking out the company’s website and social media presence, do some industry research and find out some of the innovations or developments your potential employer has gotten noticed for lately. Asking questions indicates your interest in the company, especially when your questions demonstrate knowledge of the industry sector and the company. Don’t: Most interviews end with an opportunity for the candidate to ask about anything that has not previously been covered. 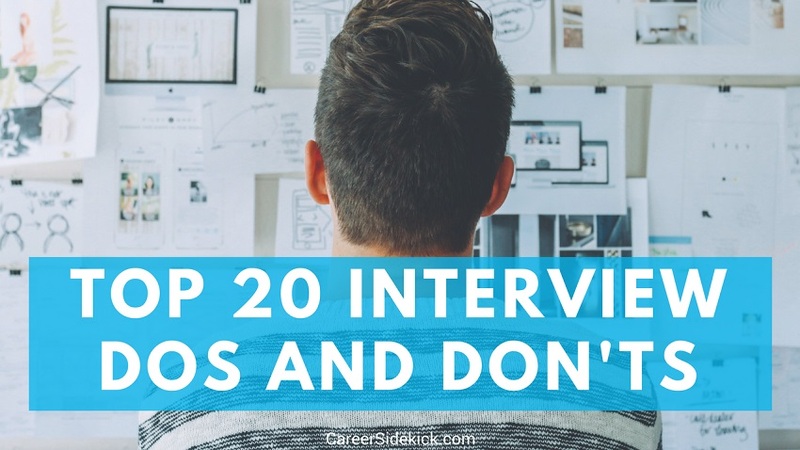 But don’t wait until the very end of the interview or for the interviewer to ask if you have any questions to ask about the aspects of the job you want to learn more about. Instead, ask questions as the conversation develops and show initiative and confidence. The more you can make the interview into a conversation, the better rapport you’ll create with the hiring manager. Since 2005, LiveCareer’s team of career coaches, certified resume writers, and savvy technologists have been developing career tools that have helped over 10 million users build stronger resumes, write persuasive cover letters, and develop better interview skills. Land the job you want faster using our free samples, templates, writing guides, and easy-to-use resume-builder software. Previous Post How To Explain Gaps In Employment (With Examples) Next Post Why Does It Take So Long To Hear Back From An Interview?